I was bummed a few weeks ago when the servers from Microsoft that supply real-time weather information were down. My copy of FS2004 locked up and it took some patience and research to discover the problem wasn't in fact on my end. It was also during this research that I ran across the press release for Active Sky 6, the latest real-time weather enhancement option from HiFI Simulation Software. Conspiracy theories aside (and trust me, I had a few), this product claims to offer superior real-time weather coverage, improved smoothing of transitions between weather regions and more accurate weather information. So, I did what any jaded sim user would do. I plunked down the $37 and prayed that this investment was worth it. I use several add-ons on my installation of FS2004, which resides on a rather average system (AMD 2.4 GHz processor with 512 RAM and a NVIDIA GForce FX5500 video card). Among them are Ultimate Traffic and Flight Environment from Flight1, FScene World Textures, and several meshes from FS Genesis. I was particularly interested in how AS6 would integrate with Flight1's Flight Environment since both tackle visual enhancements to some degree. But where Flight Environment tackles all aspects of the visual environment (i.e., sky, moon, sun, water, clouds and sky), AS6 only worries about the sky and clouds. Both products live well together, and aside for FE's propensity for overzealous lighting effects in the name of stunning bedazzlement, the two are good roommates on my copy of FS2004. But don't be confused. AS6's real purpose is to tackle the weather gaps that MSFS doesn't fill. Things like updrafts, wake turbulence and wind smoothing. How well does it tackle such a challenge? Let's find out. Installing AS6 first requires that you have at least the latest unregistered version of Peter Dowson's FSUIPC program. HiFi Simulations has worked out the licensing so that a version is included in the product. Installing and configuring FSUIPC is no big deal, but for those who are not manual readers, this may be a problem since the FSUIPC install isn't a part of the actual AS6 install process. That bit of necessary awkwardness aside, the install is smooth and predictable. Once installed, the user will notice that AS6 has placed two icons on the desktop. 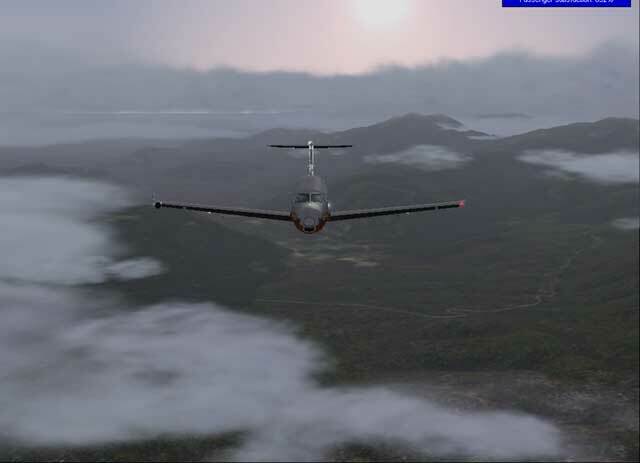 AS6 is actually made up of two components, Active Sky Graphics (which is used to configure cloud and sky types), and the Active Sky WX Engine. AS Graphics is a bare bones interface that gets the job done simply and intuitively. The user will find that there are several cloud and sky categories to select a variety of cloud types from. Several types of cumulus, cirrus and stratus clouds as well as skies ranging from Arctic to Tropical in flavor. The choices here are so vast that it can prove overwhelming at first, so there are also Randomized and "WX Influenced" options for the indecisive among us. It is also here in the AS Graphics utility that users can decide what level of detail they want their clouds to be displayed in. Choices range from the high-impact 512X512 resolution down to the framerate-friendly 64x64 variety. The lowest rez offered by Flight1's Flight Environment is 128x128, so this may be helpful to those with slower systems easily bogged down by higher cloud resolutions. 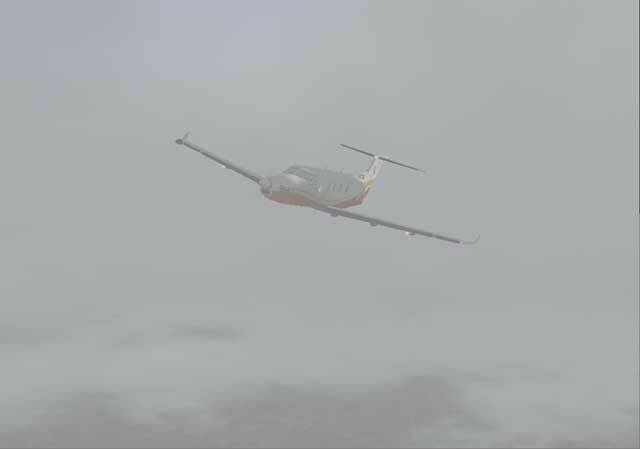 Once the skies are chosen, AS Graphics then writes the appropriate graphics to FS2004. Since it doesn't touch elements like water and sunsets, using AS6 in conjunction with Flight1's Flight Environment is no big deal, but do keep in mind that FE does write over clouds and skies when it updates FS2004's graphics. 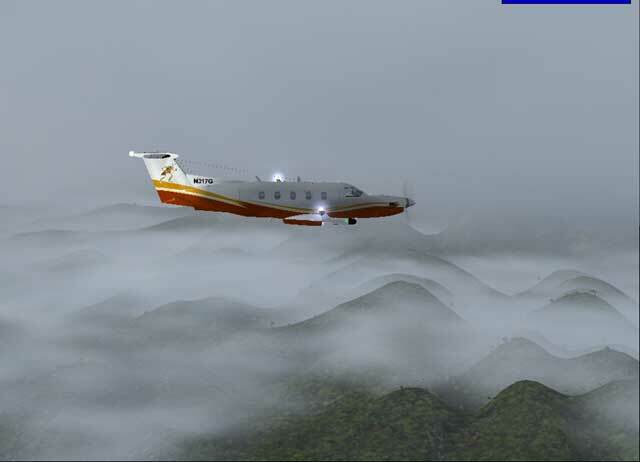 The user will have to run AS Graphics after running Flight Environment if they want the clouds and skies provided by AS6 to appear. After the graphics are configured, the next step in the process is to set up the AS6 Weather Engine. There are several options available in the Weather Engine, most concerned with preventing the unexpected changes in weather that create "popping" or sudden redraws in the weather as weather regions are crossed or updates arrive from the weather server. AS6 accomplishes this by creating a buffer called "weather suppression" which prevents weather from being updated within a certain specified area around the aircraft and/or destination airport. 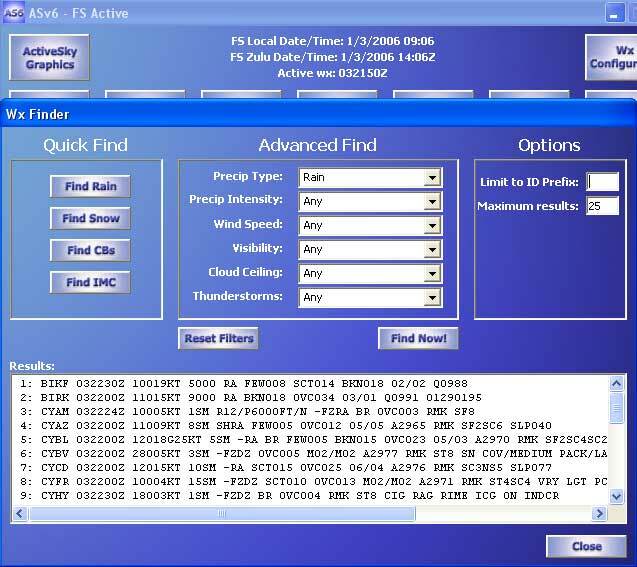 The user can specify that weather isn't updated within a certain radius of the aircraft, or when below a specified altitude. This is designed so as to prevent those annoying drastic weather changes that pop in during approach. There are many options here, limited only by imagination, but it is highly recommended that the user take the time to go through these setup options one by one in the accompaniment of the fine user manual included with Active Sky. The options are many and certain systems may be impacted more than others based on what is chosen. Once all of this configuration is in place, the only thing left to do is use the thing. The process, in case you are wondering, is to run the AS6 WX Engine and FS2004 together; two separate apps linked together via FSUIPC. In my case, I launch FS2004, load a flight plan and set myself up on the tarmac at my favorite airport. I then ALT+Tab out of FS2004 to the desktop and enter the AS6 WX Engine. When started, AS6 goes out and fetches the weather for the world and passes it through to FS2004. The resolution of the weather areas can be improved here as well by entering your flight plan (in .PLN format) into the WX Engine. By doing this, AS6 can go out and fetch even MORE weather reports that pepper your flight plan, enhancing the weather experience even more. This is especially nice if flying transoceanic routes, as this enhanced weather information means that the user will actually find something interesting between KSFO and PHNL. The visual results of all of this is stunningly real, to say the least. The multiple cloud layering, the use of cirrus clouds down low to simulate creeping fog, multiple stratus layers creating true overcast - all a marked improvement over the standard fair offered by MS or Flight1. That stupid, unrealistic default hazing effect is gone, replaced by a convincing synthesis of low-lying cirrus clouds. More playful turbulence, nasty updrafts over terrain and downdrafts on TS approaches make for some white knuckles in this AS6 enhanced world. To help navigate through the nastiest of weather, AS6 also comes with a weather radar unit that is integrated into any aircraft by simply pressing CTL+F12. Although there are other radar systems out there that are more feature-filled, I found the AS6 version to be streamlined very nicely. It's a low-impact addition that most systems can handle without much concern for framerate. Additional features in AS6 include the ability to pull up archived weather data from as far back as December of 2003. This can be useful for cases where a virtual pilot in the States wants to fly in daytime Europe, but the current weather pull would be for night time conditions due to time differences. Another cool feature is the "Find Weather" component which allows users to find specific current conditions, such as rain or snow, anywhere in the world. So, I guess the only question left is whether AS6 is worth it. Hands down, the answer is yes. I never imagined that FS2004 could be so drastically improved by one app. It makes flying around the world an even greater adventure knowing that the weather, both visually and invisibly, is so greatly enhanced. Approaches are more challenging, flight planning more vital and relative than ever. Simply put, AS6 brings with it the greatest positive impact a single application can have on Microsoft Flight Simulator.